When I was a teenager, I used to joke that growing up in my house was kind of a cross between Leave It To Beaver and The Addams Family. Mom never liked that analogy, but it seemed like a convenient shorthand to suggest that things might look "normal" at first glance, but there was something a bit different going on. In more recent years, though, I've internally dropped the Cleaver's from my point of reference as I've seen more of the Charles Addams strips. The TV show did a lot to expand on the characterizations, since the strip didn't really have any ongoing continuity and was really just clever snippets. But the basis was still there in those strips. It was very much a loving family that enjoyed each other's company; Gomez still helped the kids with their projects, Morticia tended to domestic duties, Uncle Fester taught Pugsley things that you're not supposed to learn from your dad... It was a very much a normal, extended family just that their specific interests tended to be a bit on the uncommon side. What was interesting, too, was that they did their own thing, and held many of the same values as the rest of society. Be honest, work hard, help friends in need... Honorable virtues. And, in part because of that, they always seemed oblivious to the superficial differences that separated them from the rest of the world. Their interests focused a bit more on the macabre and (sometimes) dangerous, and not on commonly popular passtimes likes baseball or hanging out at bars. Our family wasn't macabre, but we weren't exactly run-of-the-mill either. I went to one professional sports game growing up, and that was an Indians game I won two free tickets for. Dad took me, but I couldn't tell you anything about the game. But I can rattle off any number of movies he and I went to see at the Cleveland Cinematheque: some of the short films of Jan Švankmajer and the Brothers Quay, multiple Hayao Miyazaki features, Spike & Mike's Sick & Twisted Festival of Animation... Stuff that, back in the 1980s, no one else I knew had even heard of, much less seen. 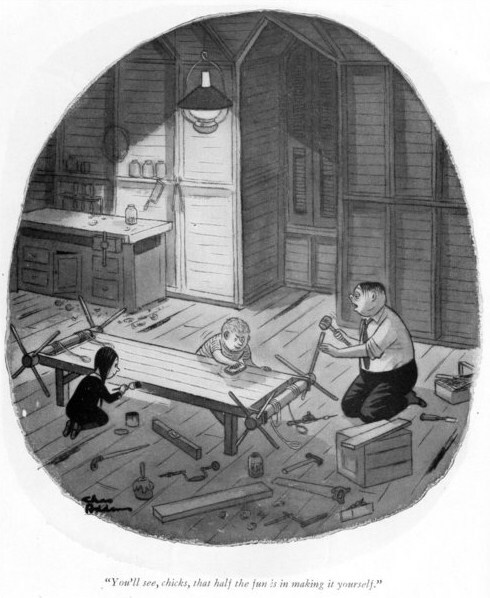 But, despite being as culturally off-center as Gomez Addams was, Dad was also a dad just like Gomez. He cared for his kids and loved his wife, and it didn't matter what the neighbors thought off the hot air balloon he made out of newspaper and coat hangers, and launched using the grill in the front yard. Happy Father's Day to my Dad, and all the other Gomez Addamses out there!